What is MU-MIMO, why would you want it, and does it actually help with gaming performance? Some technologies have a clear and direct impact on your gaming experience, like your graphics card or processor. Others are a bit more nebulous, like networking standards and technologies. Take MU-MIMO for example, the "multi-user, multiple-input, multiple-output" wireless networking technology that was introduced with 802.11ac 'Wave 2' devices. It's firmly in the latter category of technologies whose impact may not be as readily apparent. We're going to look at the pros and cons of the standard, and show who will benefit most from having a MU-MIMO enabled network. In my article How to set up your home network for optimal gaming performance, I discussed the network requirements for gaming and concluded that for a gaming network, it's not so much about high bandwidth requirements, but more about dedicated, low-latency bandwidth. Online PC gaming is all about delivering a relatively small but steady flow of data back and forth to the gaming client. Ideally this is done via a wired connection, but plenty of PC gaming is done over wireless connections due to the physical constraints of many homes. (Remember to get your next house prewired with CAT 7 going to every room!) Combined with improving wireless speeds, however, wired connections aren't absolutely necessary, and new technologies like MU-MIMO can further improve the situation. One major difficulty for wireless gaming is that there are often multiple simultaneous processes happening across the network. It's not just the gaming PC, but also the proliferation of additional clients, including tablets, smartphones, and media boxes that are connected to a single router in most households. While today’s higher end routers should be able to handle dozens of simultaneous connected clients, dividing the bandwidth so many ways can degrade the experience for all the devices. If you've experienced problems trying to play a game while other household members are streaming HD Netflix, you know what we're talking about. The previous SU-MIMO (single-user, multi-in, multi-out) standard dates back to 2007 with 802.11n. Such routers send all data out to all of the wireless clients, and the clients filter which network packets are for them and which are for someone else. As the number of wireless clients increases, this becomes increasingly inefficient and wastes precious bandwidth. Each device on the network sends and receives it's own data, as well as all the traffic from the other devices. Gaming at the same time as other high bandwidth activities are going on becomes increasingly compromised an older SU-MIMO routers. MU-MIMO was introduced in 2015 with the 'Wave 2' 802.11ac routers as a way to combat the above issues. With a MU-MIMO enabled router, data can be directed to the client that needs it, in essence giving each client its own dedicated router. A MU-MIMO router can serve up to four simultaneous clients in this fashion (one per 11ac data stream). By sending the data directly to the client, and only the client that needs it, the entire network becomes more efficient. There's less wasted data and less interference, resulting in overall significantly higher network throughput. While MU-MIMO is an impressive networking technology, there are limitations that should be kept in mind. A crucial one is that MU-MIMO in the current iteration only works on the download side of the equation. That means that MU-MIMO does nothing to improve the upload speeds, which are also important for PC gaming. Furthermore, MU-MIMO is limited to a maximum of four simultaneous clients, and no router can currently go beyond that number. Although the router can connect to additional devices, they will be served in a SU-MIMO fashion. This isn't necessarily a major problem, however, unless you have more than four active clients at a time. There are other constraints as well, like the fact that this technology only works on the 5GHz frequency. Any devices on the older (and generally still more common) 2.4GHz frequency cannot benefit from a MU-MIMO router. This is largely due to the 2.4GHz spectrum already being full of interference, which comes from the wider transmission range for 2.4GHz signals. Finally, and perhaps most critically, it's not just the router that needs MU-MIMO support, but the client needs it as well. This last limitation is perhaps one of the biggest stumbling blocks to more widespread implementation of MU-MIMO. While there are quite a few routers that support MU-MIMO, there are few client devices that currently implement the technology. 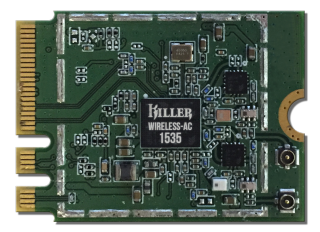 Currently, the clients that support MU-MIMO include the Killer NIC internal adapter, and the Linksys Max-Stream AC600 and Edimax AC1750 USB adapters. That presents some difficulties when it comes to testing and demonstrating MU-MIMO's capabilities. We need multiple clients running simultaneously, preferably with steady loads. That makes this more complicated than typical router or client performance metrics that focus on throughput speeds between a single router and client. A green arrow in the lower left part of the image indicates where the MU-MIMO feature is controlled. Our goal is to measure simultaneous throughput across multiple clients, while toggling MU-MIMO support on and off. (Just to clarify, the goal is to measure the performance of the local network, not the internet speed.) We used Netperf, which is designed to fully load the network connection(s) and measure the throughput. We use a version with a custom overlay for ease of use. On the hardware front, we have three test clients using different wireless adapters. Note that only one of the clients actually supports MU-MIMO, but we'll revisit this topic as we receive future adapters. Our test router is the Netgear Nighthawk X4S, which supports MU-MIMO and allows the feature to be easily enabled and disabled via the router software. In addition, the Nighthawk X4S is our pick for the Best Gaming Router. Netperf requires the use of a server computer, and a Windows 8.1 notebook with a Gigabit Ethernet port is connected to the router with a short CAT 5e cable. The Netperf software can run as a server or client, and it measures the bandwidth. All clients are connected to the network via the 5GHz frequency as required for MU-MIMO to function, at a distance of 3 meters, with line of sight to the router and no obstructions. The clients are connected two at a time and Netperf is run on them simultaneously. Three runs are completed and we report the result for the best run. Testing is done with MU-MIMO enabled and disabled on the router to assess the impact of MU-MIMO. As discussed in the previous article, How to set up your home network for optimal gaming performance, the Killer NIC software is enabled on the gaming computer, and the router’s QoS was enabled as well (using a manual configuration tuned for optimal performance), with gaming as the highest priority on all settings. The results of our testing demonstrate the effect of using MU-MIMO on a network loaded with traffic. Of the three clients tested, only the Killer NIC supports MU-MIMO, and network throughput is more than doubled (actually 134 percent faster to be more precise). There is an almost negligible improvement in performance with MU-MIMO on the other two adapters as well, though with wireless testing it's within the margin of error. In the case of the Dell’s internal wireless, it increases by just 1.5 percent, and the Edimax AC1200 USB adapter is similar at a 1.8 percent increase. These negligible increases when MU-MIMO is enabled on the router come from the overall improved efficiency of the network, since it sends data directly to the only MU-MIMO client on the network, the Killer NIC. We also looked at MU-MIMO in terms of fps using the game of Medal of Honor: Pacific Assault. We measure the fps via FRAPS, while playing a 4K video on one laptop and a 1080p video on a separate laptop. All of this is done over a cable modem connection (Optimum Online Ultra 60, 60 Mbps download, 25 Mbps upload), to simulate a household with simultaneous gaming while viewing multiple video streams. With some amount of video bandwidth, the fps on the game remained stable at 74 fps, and remained the same whether MU-MIMO was on or off. This is not surprising given the router’s QoS prioritization of gaming traffic, and a similar prioritization at the gaming notebook via the Killer NIC card. In addition, from the bandwidth measurements, even with the router saturated with traffic and MU-MIMO off, the Killer NIC is still able to connect at over 200 Mbps to the router. This 'slower' speed is hardly going to compromise the gaming experience, as evidenced by the rock stable fps measurement. Thus in most circumstances, MU-MIMO is not providing a direct, quantifiable benefit to gaming in terms of fps. However, there are plenty of advances in computing that do not have a direct effect on increasing gaming fps. Current examples include increasing RAM beyond 8GB, 8-core and 10-core processors (in general), and using an SSD as the boot drive. We can now add MU-MIMO to this list. While we doubt that few would want to go back to less RAM or a mechanical hard drive, these improvements do not directly increase the fps in testing. For the non MU-MIMO user, from a purely gaming perspective, there's currently no compelling reason to upgrade and switch to MU-MIMO. That doesn't mean the technology isn't useful, however, and as future adapters add MU-MIMO support we could see some benefits. At present, however, individuals most likely to see the benefit of MU-MIMO are those who are frequently hitting the limits of their wireless bandwidth. This would typically occur with frequent and heavy downloads (not uploads) from a NAS located on the LAN, to multiple PCs, which sounds more like a small or medium size office than a typical household. For most people, we don't recommend rushing out to upgrade your network infrastructure to get MU-MIMO. However, when the time inevitably comes that you need a new router or client, MU-MIMO is something that you can add to the 'nice to have' feature list. It won't dramatically change the way most people use their wireless devices, but there are benefits to the technology, and as homes become increasingly connected, better ways of sharing limited bandwidth will be needed.